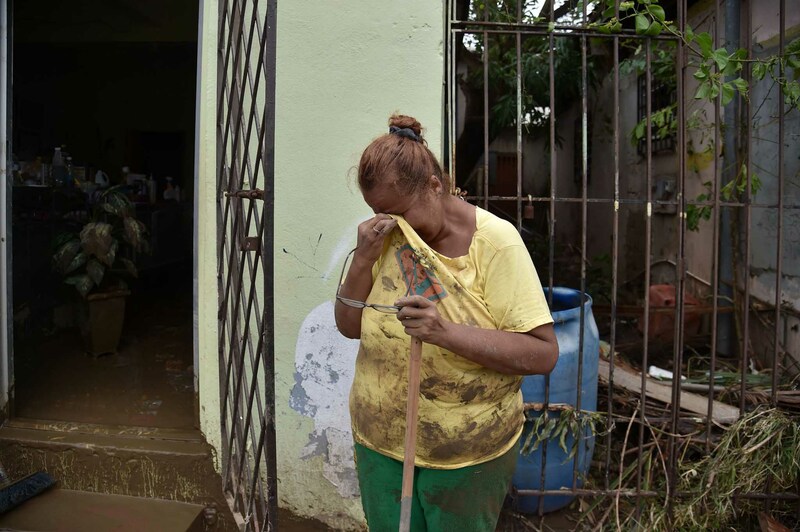 Two months after Hurricane Maria, mainstream news reporting has died down, though many Puerto Ricans are still without vital infrastructure. Only 40 percent of the population has electricity, and about 14 percent of the island still doesn’t have access to clean drinking water. Where hospitals faced extensive storm damage, the only medical care available is emergency treatment. Right now the island is experiencing miserable conditions with heat (34 degree Celsius) and pouring rain, causing new flooding. There is price-gouging on staples like rice and water, on all other basic necessities, on power generators, and on airline tickets. Cell phone service is spotty, most landlines are dead. Long queues for food and gas are common, suicides are frequent. There are burglaries, looters are stealing batteries from cars and are stripping copper from fallen power lines for resale on the black market. The official death toll is 55 but that’s just people whose deaths have been verified by autopsy. Carmen Yulin Cruz, mayor of San Juan said the death toll could be as high as 500. 472 more people died this September compared to the same time last year. 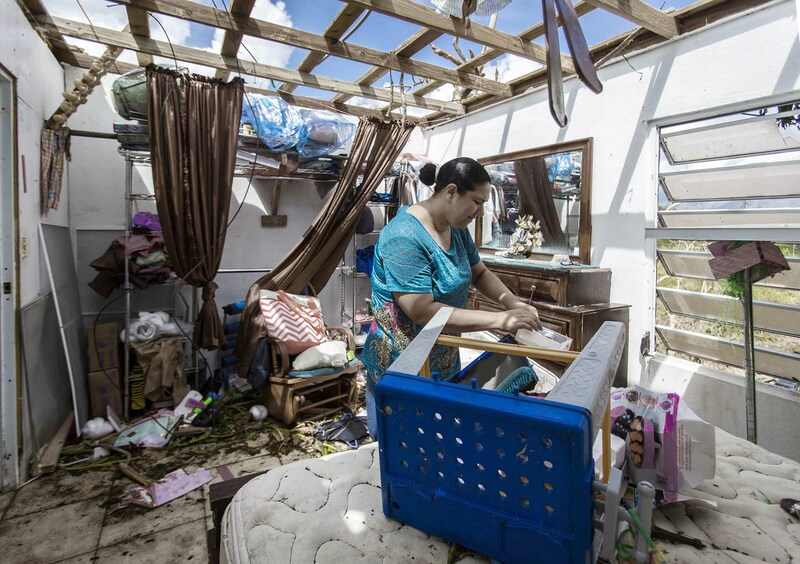 According to authorities Hurricane Maria and Irma destroyed 70,000 households completely. 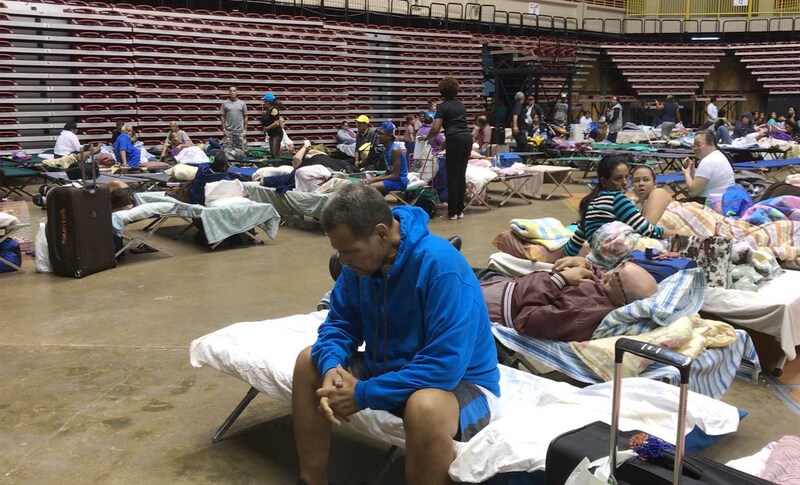 2,000 people are still living in hundreds of shelters across the island. The distribution of tarpaulins, considered a standard first emergency response by aid workers, has not happened smoothly. FEMA (Federal Emergency Management Agency) said it has provided 70,000 tarpaulins to local authorities and has 100,000 more in a warehouse. Samaritan’s Purse, an NGO, said it has given out 42,000 covers. There’s no doubt that this is not enough because an estimate 240,000 houses suffered partial or complete damages. People have to buy tarpaulins in the few open hardware stores. In San Juan tarpaulins are being sold at inflated rates of up to 125 US$. 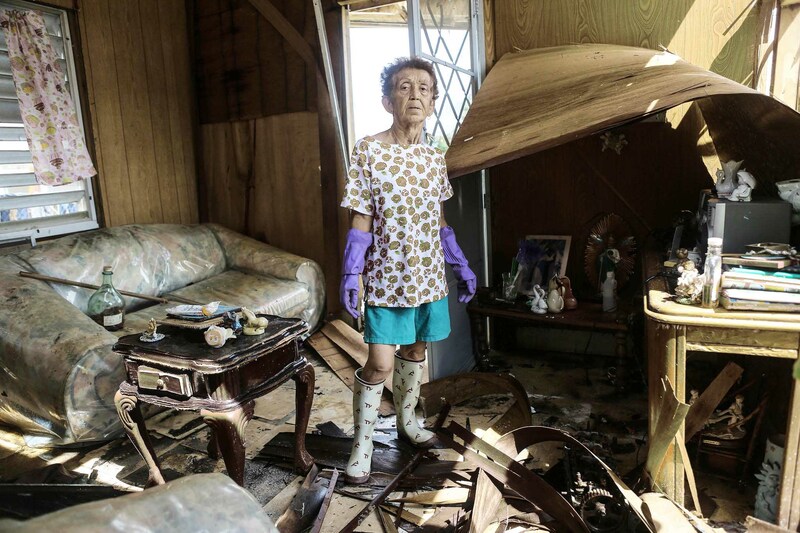 80 percent of the 60,000 households requiring roofing still have none and living conditions are terrible even if the roof is temporarily fixed because everything is sodden and brown smears from the flood water are everywhere. 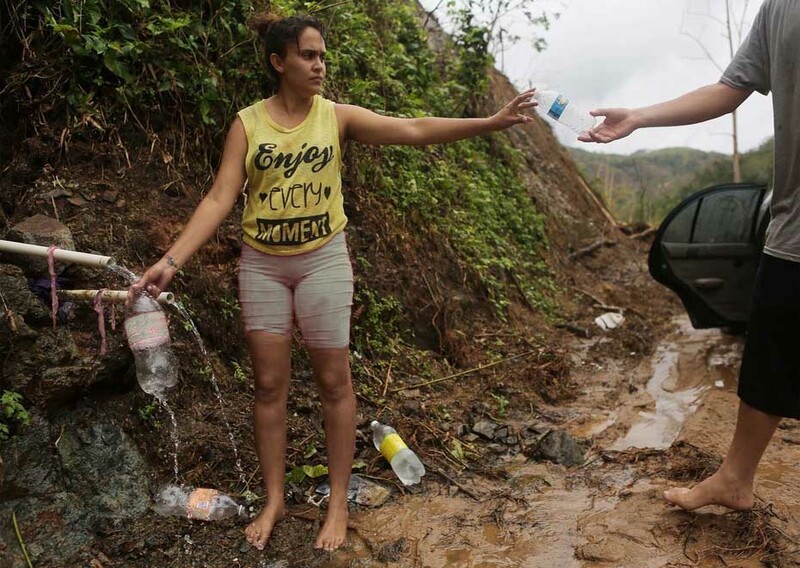 No municipality in Puerto Rico has any money to build the infrastructure that’s needed, but aid from FEMA is typically conditioned on a cost-sharing agreement that would require Puerto Rico to match a quarter of expenses. That share was reduced to 10 percent this month. Governor Ricardo Rossello is universally viewed as incompetent. His emergency-response agency AEMEAD, meant to knit seven security agencies into a fast-response team, is hampered by resignations, inexperience, and bureaucratic infighting. At a panel discussion in San Juan by the territory’s financial oversight board, economist Jose Villamil said the population could decline to less than 3 million, another, Juan Lara, said the economy could contract by 15 percent in this fiscal year. A third put the estimated storm damage at 115 billion US$ — a sum equal to a year’s economic output. People who have relatives on the main land, who are well qualified to get a job easily, and who can afford it financially, leave for good. An estimated 200,000 residents will leave the island annually as a result of Hurricane Maria. This is only the intensification of an already existing trend, because in the last decade migration from Puerto Rico to the main land was approximately half a million, 12 percent of the island’s population. Around 700,000 Puerto Ricans live in New York City and all together there are five million Puerto Ricans on the mainland, compared to 3.4 million on the island. The young, educated, wealthy leave, while the poor, the pensioners, the old, sick, or disabled stay. The ensuing demographic change will have severe economic repercussions. Puerto Rican population density in 2016 was reported at 385 people per square kilometer, and with this number it is the third most densely-populated area in the USA. As it stands now, the island will not be able to support this high number of people in future. In comparison the population density in Cuba is only 100 people per square kilometer. Many on the island feel that they are not part of the USA and that they are treated like second-class citizens. Governor Rossello asked for 94 billion US$ in federal aid, but the Trump administration seems completely uninterested in the matter. Emergency management director Abner Gomez resigned and Lt. Gen. Jeffrey Buchanan, who leads the military relief effort, is also leaving. Buchanan announced that troops would wind down operation as all roads are cleared. He conceded in an interview, that the land component of the military’s response could have been more robust and that he should have pushed for more resources like helicopters and logistical supplies. The military helicopters which were deployed are now pulled out. There is no public transport system, nearly everybody owns a car. There are 614 automobiles per 1,000 people, compared to 38 cars per 1000 people in Cuba. And unlike Cuba, where 50 year old vehicles are kept running with ingenious tinkering, Puerto Rican cars include luxury brands, Porsches, Ferraris, BMWs, you name it. The fancy cars of course need an equally luxurious road network. There are 289 kilometer roads per 100 square kilometer, more like in most European countries. In Cuba there are 55 kilometer roads per 100 square kilometer. Most roads are lined now with broken trees, mud, and other debris. The military came in and just pushed it all to the side to re-open the roads as quickly as possible. Clearing the roads though was only a partial fix because many are washed away or have disappeared in giant sinkholes. There are 3,500 reported incidents of hurricane damage to roadways, with repair costs estimated at 250 million US$. 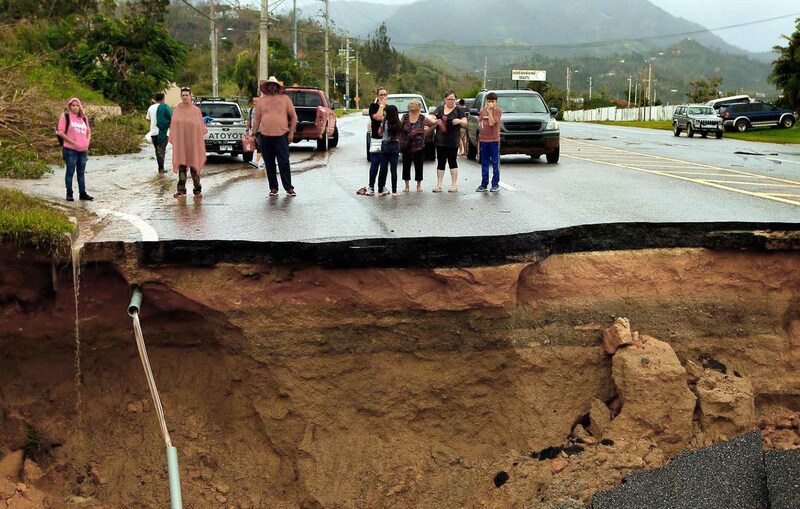 Highway 2, the vital 143-mile artery between San Juan and Ponce, was also damaged with eastbound traffic squeezed into a single westbound lane and westbound traffic detoured. 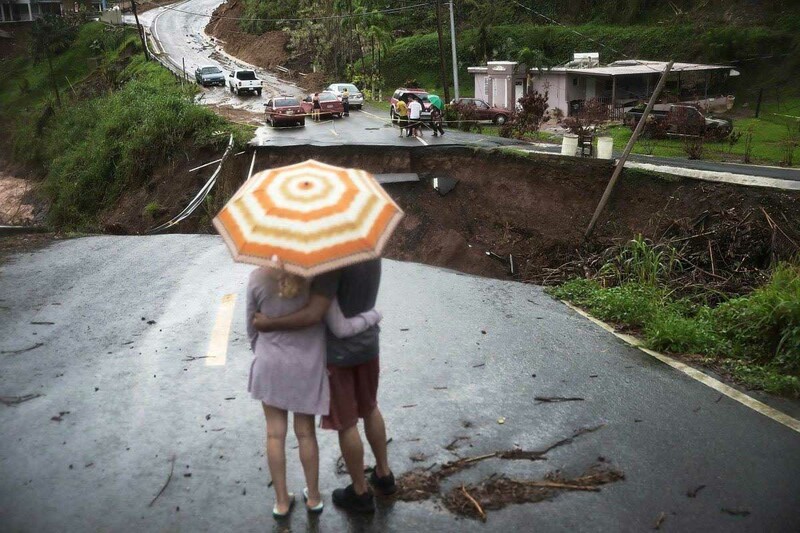 It has been fixed now, but there are damaged roads and bridges all over the island and the longer the repairs take, the more costly they get, as relentless Caribbean rain continues to erode damaged stretches of highway, particularly those buried by mudslides. Reconstruction is hindered because there is still no power, not enough trucks, no electrical light, and only intermittent cell phone service. 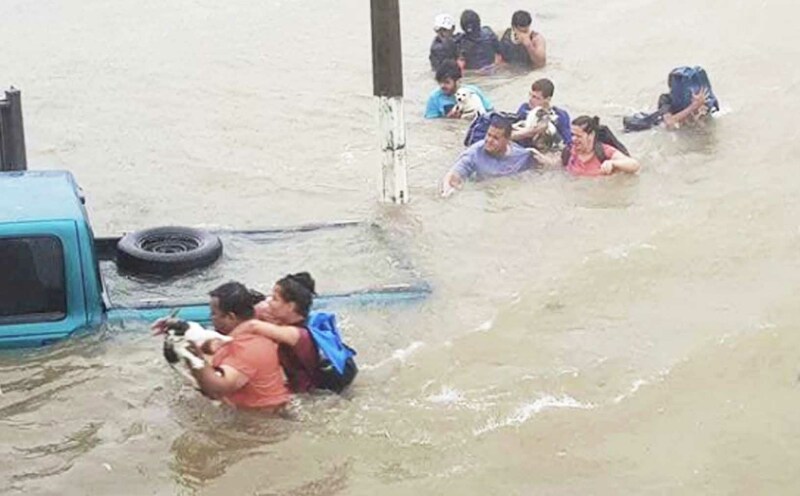 With much of the population cut off from power and communication, the island is forced to divert hundreds of trucks and drivers to help bring supplies to needy citizens. Few vehicles are left to transport the equipment and materials needed to fix infrastructure. Puerto Rico’s water and sewer authority PRASA has just 125 trucks to service the island’s 3.4 million residents. Additional vehicles were requested from FEMA as well as from the US Army National Guard but have not arrived yet. Men, women, children are collecting water from open springs and from the sides of the mountains. The authorities have warned against using the water for drinking purposes, saying it may be contaminated. Some people are exploiting the elderly and the disabled by selling them gallons of potentially contaminated water collected from these points. Those who have water report that it often appears grayish-brown coming out of their faucets. Water treatment plants depend on electricity and because of the frequent blackouts they can stop working at any moment. People have been advised to boil tap water or use purification tablets, but without electricity there is no boiling and purification tablets are hard to get by. Medical workers report waterborne diseases across the island, especially gastrointestinal illnesses, most often involving fever, vomiting, and diarrhea. There is also the danger of disease-carrying mosquitoes, who find an ideal breeding ground in puddles from the flooding and in water that has pooled in hurricane debris. The mosquito population has exploded and people who are camping outside become prey to mosquito-borne diseases. There is also a leptospirosis outbreak with 74 reported cases, caused by contaminated water entering the bloodstream through cuts and sores. The island’s 18 ‘Superfund’ sites — areas so polluted that the US EPA (Environmental Protection Agency) deems them hazardous to human health or the environment — posed a potential risk even before the hurricane hit. Twelve of these sites sit on karst, a geological formation made of porous rock that allows toxic chemicals to flow down from the surface into groundwater. Rotting debris can be still seen outside almost every property, as though the hurricane had only just happened. Only 7 percent of the debris has been cleared and two month after the storm municipal workers are still removing the heaps of discarded furniture, appliances, and other household paraphernalia which residents have cleared from their ravaged homes. The garbage heaps raise public health concerns as they attract rodents and mosquitoes, but the municipalities don’t know where to put the garbage. There is little to no room left in Puerto Rico’s landfills and even before the hurricanes most of the islands 29 operating landfills were beyond capacity and nearly half had been ordered closed amid concerns over risks to soil and groundwater. Another problem is the separation of toxic waste. Crews are working from dawn to dusk to separate dangerous things like paint cans, household cleaners and televisions from benign materials, but time pressure and the sheer magnitude of the task may undercut the efforts. Without electricity refrigerators and freezers don’t function, affecting what people eat and drink. Electric stoves, washing machines, computers, ATM machines, tools, industrial equipment become useless. There’s no air conditioning, no fans to alleviate the tropical heat. Without working traffic lights, crossings and busy intersections are prone to accidents. Without lighting, offices, workshops, restaurants, and other businesses must close at dark, adding to Puerto Rico’s already high unemployment rate. Even in areas with power, residents must deal with daily blackouts. San Juan had two massive power outages in November, reminding of the challenges the island continues to face. According to the public electric power company PREPA, there was a technical failure in unit 7 at the San Juan Central plant, later on unit 8 went out of service. The island-wide power generation collapsed from 50 to 22 percent (of capacity before the storms). Several medical centers lost power. Power generation is 40 percent at the moment, but the number constantly changes. 31 of the 78 municipalities still have no power at all. Fixing the power grid admittedly is a difficult task, because Puerto Ricans consume 5310 kWh per person per year. Though this is much less than on the mainland, where 12,077 kWh are used, Cubans in comparison only need 597 kWh per person per year. Companies and affluent folks fill the gap with power generators, one can hear the sound of these generators all over the island, disturbing the sleep of neighbors. But generators cannot be used in many places, because pouring rain and floodwaters make it dangerous to switch on any electrical devices. The head of PREPA, Ricardo Ramos, testified before the US House Natural Resources Committee, in a hearing which amounted to another step towards the privatization of the power utility. Ramos has resigned since amid questions about slow repairs in the hurricane’s wake and a controversy over a 300 million US$ contract awarded to Whitefish Energy Holdings, headquartered in Interior Secretary Ryan Zinke’s Montana hometown. Whitefish was billing the Puerto Rican public power company 319 US$ an hour for linemen, nearly 17 times the average paid to Puerto Rican electrical workers. The deal was canceled after it faced scrutiny and outrage, but a 200 million US$ contract with Cobra Acquisitions LLC, which may be as scandalous, is still in place. Cobra Acquisitions LLCI is a subsidiary of the Oklahoma-based fossil fuel company Mammoth Energy Services. With the help of FEMA, Cobra negotiated a 15 million US$ upfront payment from PREPA and it will be paid biweekly. The initial contract is for 120 days of work, though Cobra stated repeatedly that they expect that to be extended. Like Whitefish Energy Holdings, Cobra Acquisitions LLCI is a small, previously unknown company with no experience in storm damage repair. PREPA is currently 9 billion US$ in debt and pays more than one billion US$ a year to off-island oil and gas companies. It is completely dependent on imported oil, generating 47.4 percent of its power from that source alone. Yet even as the utility’s leadership has acknowledged that its fiscal sustainability relies on a transition away from oil, its plan has been to transition not to distributed renewables — which are more resilient to storms — but to centralized natural gas. Just 3.3 percent of Puerto Rico’s electricity is derived from clean energy, but nearly a third comes from natural gas. PREPA’s future plans include the construction of a 400 million US$ liquid natural gas import terminal. The ports, the power grid, the highways, the road system in general, the water and sewage systems all need to be rebuilt and improved. Hospitals and schools have to be repaired or even completely replaced. 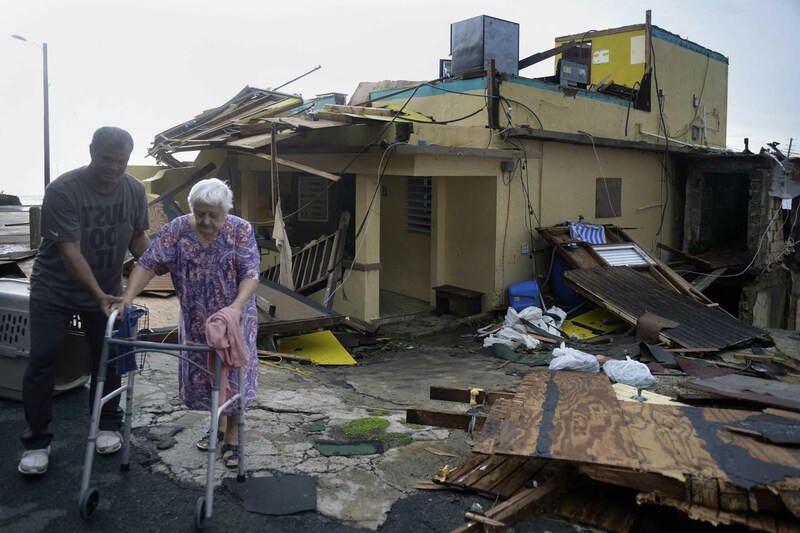 Rebuilding and mending the destruction caused by Hurricanes Irma and Maria will cost an estimated 110 billion US$. Until now Congress has approved a 5 billion US$ loan, a pittance, compared to the 94 billion US$ Governor Rossello has called for. Private investors will step in, not in an act of charity and welfare, but to extort high profits either in form of interest payments or as road tolls, fees, increased electricity, water, and sewer rates. This would give the Governor dictatorial power to close or sell off public agencies in order to ensure payments to the bondholders of the island’s 74 billion US$ debt. An already existing 10-year fiscal plan aims to reduce the number of public agencies from 130 to 35 and to cut 2.75 billion US$ in expenditures annually. Obama’s PROMESA (Puerto Rico Oversight, Management, and Economic Stability Act), effectively removed the financial powers of the Puerto Rican government and the autonomy of its 78 municipalities. The by PROMESA installed 7 member financial control board has ordered strict austerity. Cuts to the public-education system, the appointment of an “emergency manager” to control the electric grid, furloughs, pension reforms, and the winding down of GDB (Puerto Rico’s Government Development Bank) are possible options. The dismantling of GDB would mean, that millions of dollars of municipal-tax revenue which GDB held in trust would be used to pay GDB’s creditors. On the other hand, the financial control board has developed a plan that would wipe out 79 percent of the territory’s annual debt payments, yet this plan meets strong opposition from hedge funds (the so called “vulture funds”), and banks — it has to be seen if it can be realized. The transformation of schools into charters would allow the entry of private corporations, seeking to profit from cost cutting by reducing teachers’ wages and benefits, including pensions. 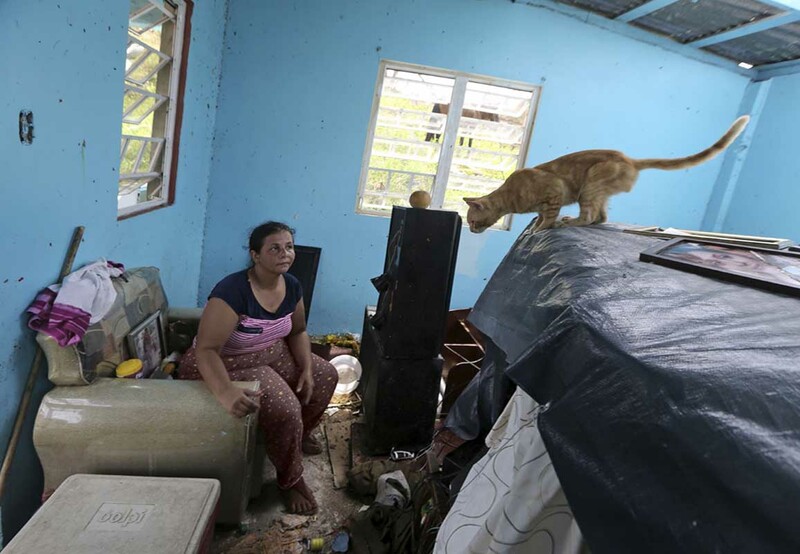 The teachers unions have accused Keleher of deliberately keeping many of the island’s schools closed, even after teachers and other volunteers cleared them of debris and cleaned them. Earlier this year Keleher closed already 179 schools, which had less than 250 students, to save 7 million US$. 27,000 students were forced to change schools and 2,700 teachers were sacked. Students from rural districts and mountainous areas now have to travel long distances to other schools. Teachers unions in response to the privatization plans organized protest marches and sit-ins, 21 teachers were arrested during a protest in San Juan. Privatization goes together nicely with the gutting of labor protection and social spending. (https://mato48.com/2017/09/27/cuba-and-puerto-rico-a-tale-of-two-islands/) a comparison was made between Puerto Rico and Cuba. Cuba’s recovery went smoothly while Puerto Rico is still a mess with no end in sight. Cuban authorities admittedly have it a lot easier, because all infrastructure is on a much lower scale, so consequently less damage occurs and less has to be repaired. Compared to Costa Rica Cuba has only a quarter of the population density and a fifth of the road density, Cubans use only 11 percent of the electricity and own only 6.2 percent of the cars per capita. They also were lured by cheap credit, accumulating debts which became unsustainable. Cubans on the other hand are used to a scarcity of resources. A consumerist lifestyle is out of the question, as the land, isolated for 57 years by the US embargo, can provide not much more than the bare necessities. Austerity is an integral part of life, but it is accepted because the burden is shared equally and there is a climate of solidarity, cooperation, and national pride. Cubans who don’t share these social principles have long since left for Florida. In Puerto Rico something similar would happen, leading to a smaller, more equal, just, and compassionate society, but the overlords in Washington and New York have other plans. 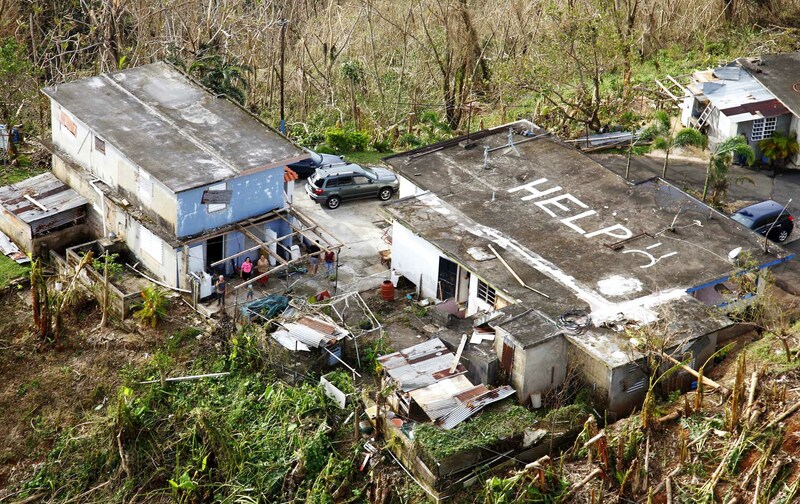 Puerto Rico will be exploited, sucked dry, pushed into debt slavery, turned into a sweatshop zone. It will still not resemble Haiti, it will still be nominal richer that Cuba, but many will suffer, will be stressed out, and the less fortunate will be pushed aside, abandoned and ignored. On the various global happiness indexes Cuba surely has surpassed Puerto Rico by far.